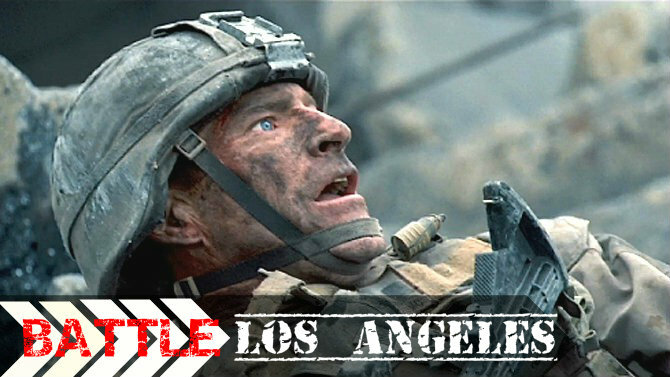 'Battle Los Angeles' was decent, not good, just decent. If you want a movie that you can mindlessly watch and chew your popcorn, then this is the movie for you. You shouldn't expect much of a story or any useful dialogue. Just stock up at the concession stand and enjoy the ride. Unfortunately the typical hollywood script writer thinks that you're stupid and don't have the emotional depth of a gnat. When will hollywood learn that the average person is smarter than they think we are? And yes, most of us who have a job, a house, and a family are average people. But I digress, this is a guy's movie. Lots of guns, lots of explosions, lots of thrills, and plenty of other manly activities. So if you're a guy, then you're gonna like this film. If you're a girl like me, then you're going to kinda like this film. But you won't want to see it again. One big pro about this movie are the battle scenes. The battle scenes are intense and based on my limited knowledge, they are very realistic. I heard that they based them on actual battles fought in the middle east and it shows. Plot: A series of mysterious "meteorites" crash onto earth's coastlines, near major cities. Lo and behold, the objects are soon revealed to be invading spacecraft. So what do you do..."send in the Marines." The U.S. Marines of L.A. attempt to defend against alien ground forces and assist in the evacuation of civilians in preparation for the military's bombing of Santa Monica. Staff Sergeant Michael Nantz, handsomely played by Aaron Eckhart, has plans to retire but his plans are cut short when the aliens attack. Aaron's character is a recent recipient of the silver star, but surprisingly he's not a popular guy with the grunts, as he has the bad habit of getting good men killed. So guess what, the Staff Sergeant (the working man's-don't-call-me-sir) has to prove himself because the men don't trust him. Better yet, he's outranked by the inexperienced college-boy Lieutenant, William Martinez (Ramón Rodríguez). Haven't seen that one before have you? At least they made the Lieutenant somewhat intelligent and conscientious, even though he was a tool. That was refreshing. Anywhoo, a couple of other interesting characters are introduced, including resident tough-girl actress Michelle Rodriguez, who plays Air Force intelligence Technical Sergeant Elena Santos. Eventually, they find five civilians, whom they try to transport to safety. The rest of the film is basically a rescue mission gone awry, with lots of special effects, lots of fighting, and lots of cliches.